Our Bug Detector technology is designed to seek out the emissions from electronic listening devices such as hidden microphones connected to surveillance bugs, cellular phone bugs, and other surveillance transmitters. When deciding on which bug detector is to be used in the electronic detection phase of a sweep, countersurveillance users must weigh the cost of the equipment against the level of security required. This is especially true when choosing the RF detection devices for protection against hidden microphones, audio surviellance equipment, and other listening devices. In this case, the appropriate instrument must be governed by the range of covert-transmitter operating frequencies, modulation techniquies, drift, harmonics, and power levels that must be detected. From SpyZone, the simple solutions are presented as basic types of RF counter surveillance to be used are the bug detector, field strength meter, and near field detector. 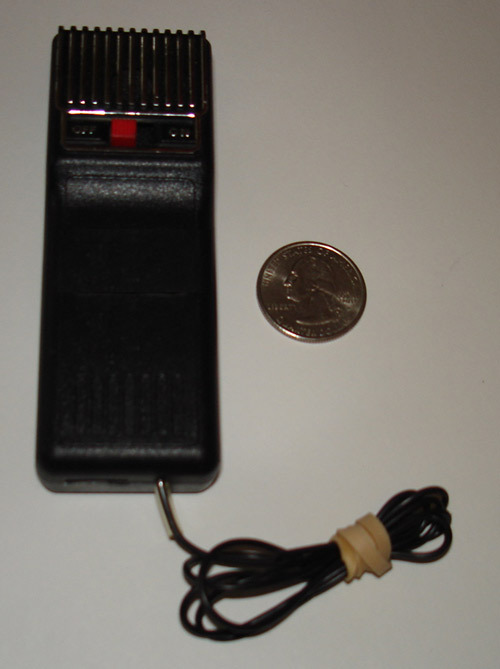 Not shown or described are the sing around or feedback detector, an earlier technology commonly used by bug detector enthusiasts. All bug detector systems from SpyZone are portable, hand held, battery powered, and relatively broadband untuned radio receiving devices that are simple to operate, and offer a quick, rairly reliable way of checking fo the presence of covert radio transmisions. 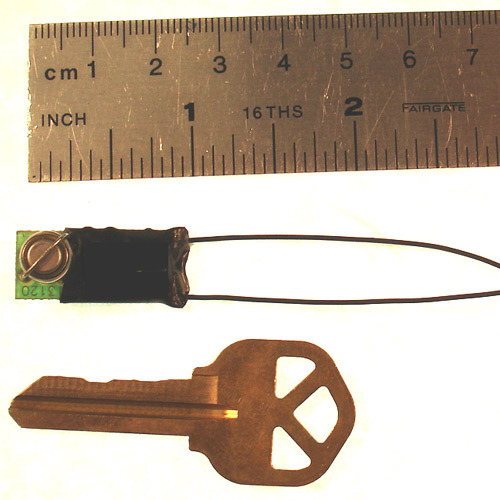 Shown here is an RF Transmitter, one of several electronic listening devices from a collection of surveillance bugs dating back to the 1960's. Discovered by using a bug detector, this and other surveillance transmitters were used for broadcasting conversations. Because of its size, it was not as easy to conceal as the transmitter shown below. This listening device is powered by a hearing aid battery and was discovered by using a hidden microphone detector, one of several bug detectors offered by SpyZone to scan the radio spectrum from 50 MHz to 6.0 GHz.